I’m reminded of this Van Morrison song when I visit completed projects like the City of Fairlawn’s Wetland Oxbow. This is a project where the end result was so sweet, and everything fell into place. The project started with the initiative of the Service Director and Mayor to reduce local flooding in the southern portion of the city. The intersection of Brunsdorph and Ridgewood Road had historically flooded and so had the homes nearby. With that charge, we looked into our knowledge toolbox and, after brainstorming as to how to utilize an un-programmed park nearby, proposed the solution of a wetland oxbow. 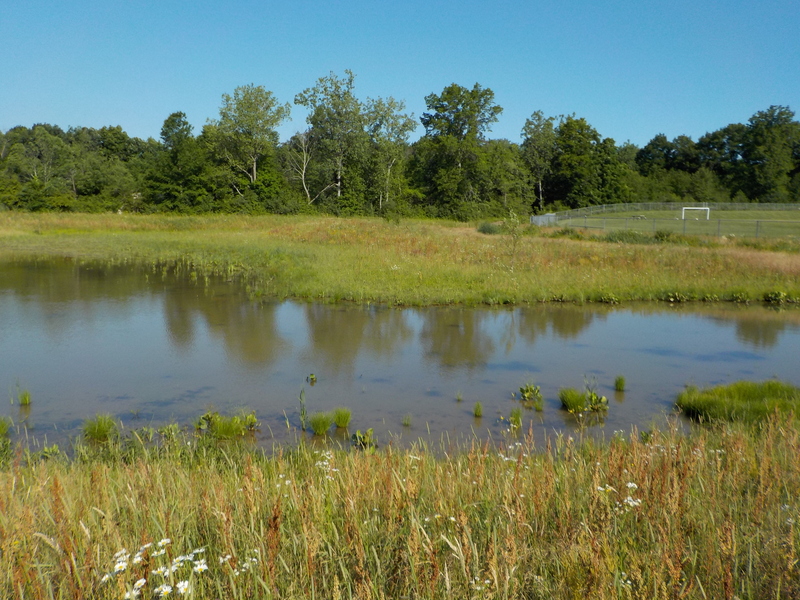 Wetlands stabilize streambanks and prevent erosion by absorbing energy from flood waters. Wetlands also support a wide variety of plant and animal populations. Did you know that in Ohio, wetlands support roughly two-thirds of the bird species and three-fourths of the amphibian species that are listed as threatened or endangered, according to the Ohio Department of Natural Resources? Wetlands are also a cool place for people to hang out, watch birds or kill time while you’re waiting for a soccer game (the wetland is located next to the Fairlawn soccer fields). Wetlands are even described as “nature’s hazard insurance” and likened to sponges, since they store rain that runs off the land and slowly release it to the atmosphere, groundwater, adjacent lakes, rivers and streams. While the ability of any particular wetland to reduce flood damage varies, strategic wetland protection and restoration can help reduce damage by controlling flood peaks. They can also reduce the need for expensive projects such as levees, detention ponds and reconstruction of flood-damaged roads. Healthy streams and wetlands filter sediment, nutrients and pollutants from our waterways. Excessive sediment and nutrients can smother fish and bugs in our streams, increase flooding by filling in pools and create erosion. Good stream water quality can even reduce treatment necessary to clean drinking water. This restoration project in Fairlawn, for example, can filter and reduce more than 50 tons of sediment per year. That’s more than four dump trucks full! Sediment reduction is especially important for this project in Fairlawn due to its location along Smith Ditch. Smith Ditch is a petition ditch. A petition ditch takes its meaning from the rich history of Ohio when an intricate system of agricultural ditches were created to drain fields, encouraging agricultural economic growth. These petition ditches allowed rainwater to soak into farm fields and drain away from the crops during a flood. As shopping malls increasingly populated the state building over these farms, the speed of rainwater flowing into these ditches increased– eroding stream banks and transporting sediment downstream. Wetlands like this project, though, trap sediment and decrease the speed of floodwater (as shown in the aerial photo below, taken just after a heavy rain storm). 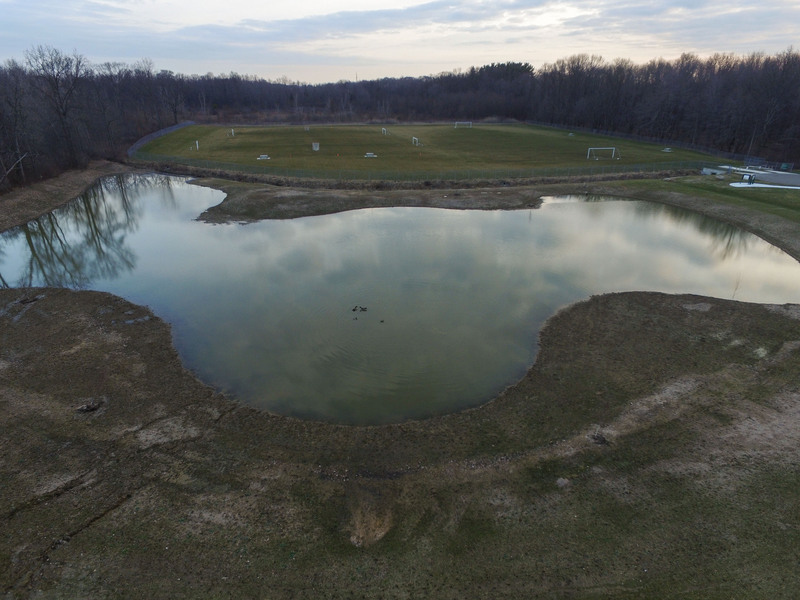 The wetland oxbow in Fairlawn took three years from idea to completion. There were many challenges along the way that became so worthwhile in the end—when you can watch a blue heron skim the water’s surface or a child’s eye wide with wonder as a frog plops onto the wetland from the shore. 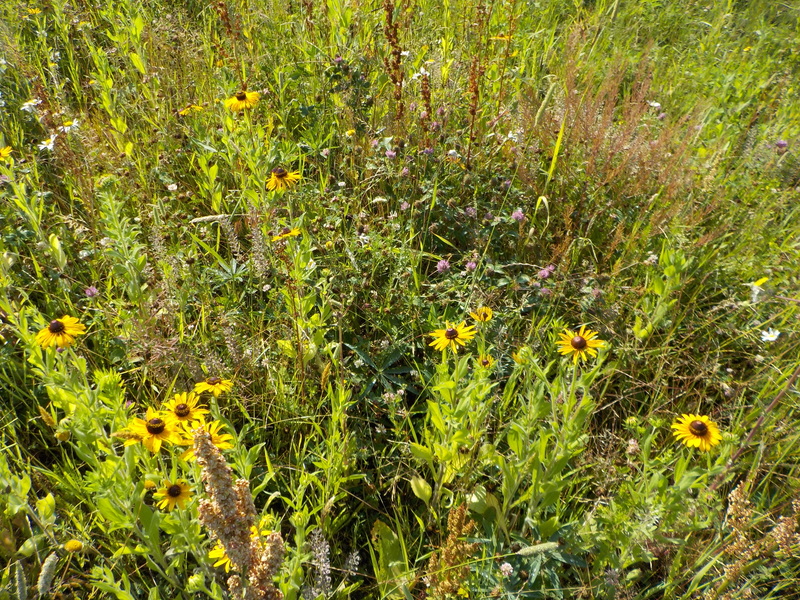 The challenges fade away when you see successful, lovely wildflowers that provide food for pollinators (like bees and butterflies) growing along the wetland’s edges. To know that we built a project that provides habitat for animals, offers food for bees, reduces flooding and is open to the public, providing education for all . . . it’s great to know there’ll be “days like this”! Thank you to the Ohio EPA for partial funding of this project, the City of Fairlawn for the vision of a public open space and Cavanaugh Construction for constructing this fantastic piece of living science.